I know, I know, this is not a high-brow recipe, but turkey nuggets are damn good and I thought I’d share my recipe with you. 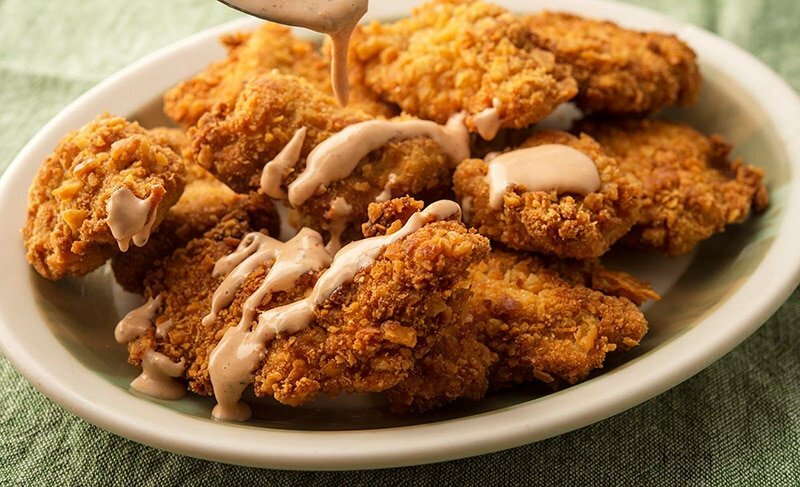 Chunks of fried awesomeness dipped in the sauce of your choice is never a bad idea, especially when the sauce is Mississippi comeback sauce, which, if you have never heard of it, is basically All The Condiments mixed together. 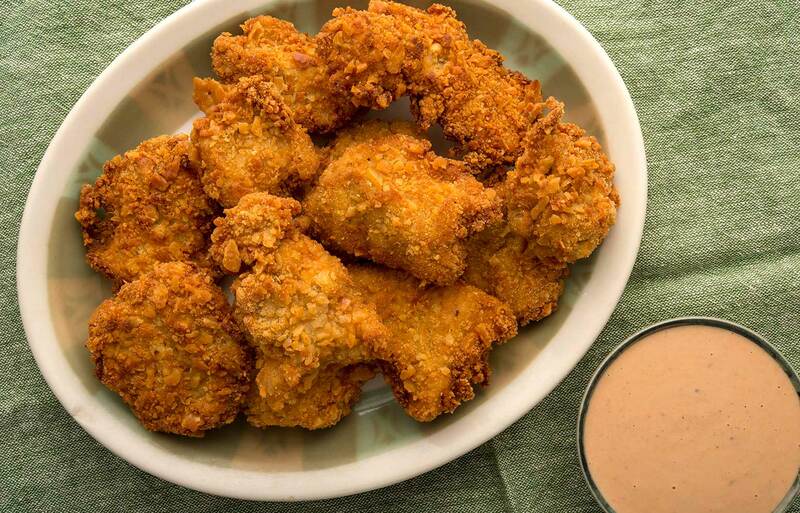 The inspiration for my rendition of turkey nuggets comes from another Southern recipe I make, snapper bites. Snapper bites are basically this, only with red snapper or some other firm white fish. Chunks of fish or turkey, breaded in Saltines, fried in something that makes dieticians shudder, and served with something irresistible. I make turkey nuggets with the thinner portion of each side of the turkey breast, the triangular section closest to the bird’s tail. On a store-bought turkey this is not so pronounced, but on a wild turkey is is always very thin in comparison to the front portion. This section of turkey breast is excellent for cutlets, too. 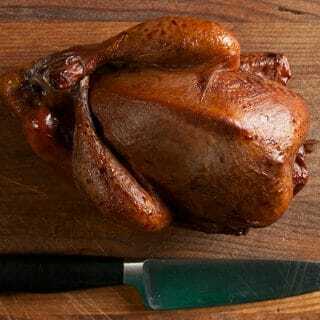 It can help to brine the turkey first, which helps prevent it from drying out. My brine is super simple: 1/4 cup kosher salt (I use Diamond Crystal) to 1 quart of water. Brine for only a few hours, I’d say between 2 and 6, tops. You then cut the turkey breast into chunks, dredge in flour, then in a Louisiana-style egg wash — it has mustard in with the beaten eggs — then in either breadcrumbs or Saltines. I prefer Saltines. Fry in something that makes you celebrate your wild turkey, like fresh rendered lard (the kind that’s refrigerated or in any Latin market), or peanut oil or, yes, I suppose regular vegetable oil. The comeback sauce is right from my friend John Currence’s book Pickles, Pigs & Whiskey. It is, more or less, all the condiments: ketchup, mayo, Worcestershire, mustard, even something called Heinz chili sauce, which I’d never heard of. All of this makes comeback sauce strangely dirty, in a good way. Dirty in the sense of eating three orders of Burger King onion rings, or a whole carton of Krispy Kremes. You could use whatever sauce you want, however. I dunked cold, leftover turkey nuggets in hot sauce and it was fine. More than fine, really. This is also to say that cold turkey nuggets are almost as good as piping hot ones. I use wild turkey breast here, but you can use store-bought, too. You can also use regular breadcrumbs or panko, although I like the Saltines. And any sauce that makes you happy will be fine here. Or no sauce at all. To make the sauce, put everything in a food processor or blender and puree. Set it aside. Mix the flour with the spice mix; I use Cavender's mostly. Mix together the eggs, buttermilk and mustard. Mash the Saltines. I do this by putting them in a heavy freezer bag and crushing them with a rolling pin. Dredge about 1/4 of the turkey chunks in the flour, then the egg wash, then put them in the freezer bag with the crushed Saltines and shake well to coat. Before you take them out, press the crushed Saltines into the meat. Set the chunks on a baking sheet, and do the rest of the turkey, 1/4 of it at a time. 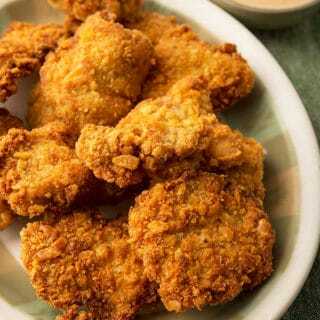 In an ideal world, you would rest the breaded turkey nuggets in the fridge for 1 hour. Do this if you can, because it will make the coating stick to the turkey better. If you are rushed for time, you can skip this. When you are ready to fry, put enough oil in a large frying pan to come up about a finger's worth (about 1/2 inch) and bring it to somewhere between 325F and 350F. Set a cooling rack over a baking sheet and put that in your oven. Set the oven to "warm." Fry the turkey nuggets in batches so you don't crowd the pan. Set the finished turkey nuggets on the rack in the warm oven while you do the rest. Serve with the comeback sauce. You can find dozens of wild turkey recipes, as well as recipes for other upland birds, here on Hunter Angler Gardener Cook! Made this recipe with tenders from a wild turkey (perfect since) and put them on a sandwich, and it was fantastic! I like the addition of mustard to the egg dip – it’s not something I’ve done in the past but will do again in the future. And they were ALMOST better as leftovers for breakfast.